Look here for a slightly more formal CV. This spring (2008), FAST became a Microsoft subsidiary, and over time I’ll surely transmogrify into an honest-to-God Microsoftie. As it happens, I’m per­fectly fine with that. I hold a Master’s Degree in Computer Science from the Nor­we­g­ian In­sti­tu­te of Tech­no­logy in Trond­heim, Nor­way. 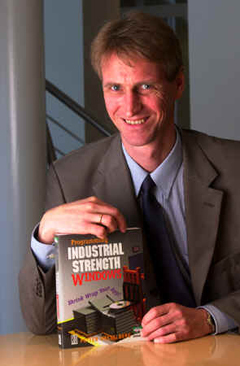 My concern for the quality (or the occasional lack there­of) of soft­ware develop­ment has led me to write numerous articles on the subject, and a book called Pro­gram­ming Industrial Strength Windows. I held the Norwegian record on the 400m hurdles from June 1983 to May 2003. I’m sorry to have missed out on the twenty-year celebrations, but otherwise I don’t mind losing it too much. I own a grand piano, which I use mainly when I want to annoy the neigh­bors. I live with a wife (mine) three sons (also mine); attempting to bring them up takes up all my remaining time (and then some). Your app­li­ca­t­ion lives in a hostile environment, and a certain amount of paranoia is fully justified. Visual Basic’s ease of use does not turn amateurs into professional pro­gram­mers; it is no substitute for ac­tu­al knowledge and experience. …but listen to the reaction I got from the programmer when I reported the problem: “No, I’m not going to do anything about this. Nobody else has reported the problem, and normal people wouldn’t do such as dumb thing anyway.” Idiot, he didn’t say. Whenever a pro­g­ram goes into a modal loop, it suddenly gets immeasurably dumber.